In January 2019, Infinito Wallet's long-awaited DApps browser - App Square, was officially available with support for Ethereum DApps to serve everyday user needs. Their aim is to prove the power beyond cryptocurrency of blockchain to users and thus, bring mass adoption to this ground-breaking technology. To achieve this, Infinito team is about to upgrade their DApp "store" into another level by partnering with global leading EOS block producers and EOS block producer candidates including JEDA, EOSYS, HKEOS, and EOS Nairobi to enable support for EOS DApps and other groundbreaking features such as EOS account self-registration and EOS voting for Block Producers. JEDA is an EOS block producer from Japan and EOSYS is the first EOS block producer candidate from Korea. Meanwhile, HKEOS is EOS block producer candidate from Hong Kong and EOS Nairobi is block producer candidate from Nairobi, Africa. 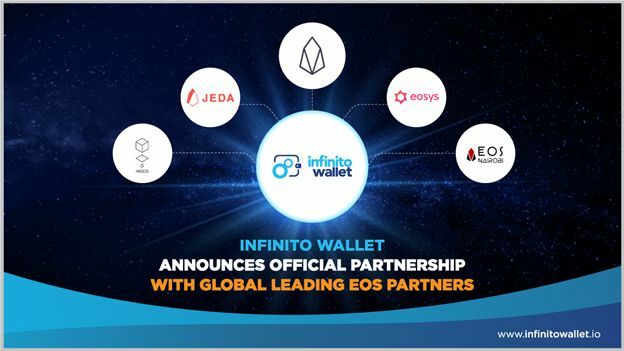 Partnership between Infinito Wallet and these four partners is expected to benefit not only Infinito Wallet users but also global EOS community. Infinito Wallet is a world-leading Universal Wallet, home to the widest range of leading cryptocurrencies and blockchain services for consumers. Throughout the past one year, Infinito Wallet has been widely appraised as world's best and most universal mobile crypto wallet by users and domain experts (Finder, Coinlist, AbitGreedy, Blockonomi, Coinpedia, etc.) alike. with their set of features for EOS users including: support for all EOS tokens, stake/unstake NET and CPU bandwidth, buy/sell RAM, import/export EOS private keys. In addition, last year, Infinito Wallet has organized successful free EOS account registration campaign with well-known EOS block producer and EOS block producer candidates with thousands of EOS accounts registered. Through this remarkable collaboration, Infinito Wallet users can soon enjoy innovative EOS DApps, besides fully managing their EOS assets. Infinito Wallet along with their partners aim to build brand credibility and branding to further spread global adoption of EOS blockchain and its various unique technologies. In order to build an ecosystem of practical blockchain services, the Infinito team is selectively expanding their partner network. More blockchain partners and DApp providers are welcome to join Infinito Wallet. Contact the team behind the Universal Wallet via [email protected].